In the previous post I introduced Graphology-the science that connects the analyzing of a person’s handwriting to their emotional psychology, their state of being at the time of writing. Beyond being a fascinating set of ideas in general, graphology is also a tool of agency and futurism. 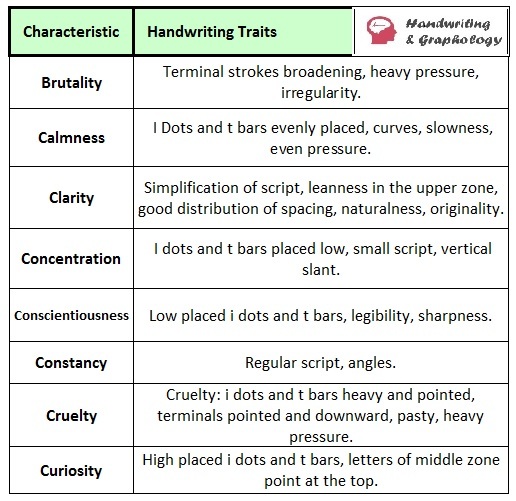 When comprising their analysis graphologists look at quite a few (like, a lot) nuances, characteristics of handwriting traits. Here, I’ll share a few with you as best as I understand them. The internet is absolutely teeming with the possible meanings behind what every stroke, connection, letter shape/size, etc. could mean. The following are my summarizations based on topical internet research. Here are some salient features to which graphologists pay attention when analyzing handwriting. In the ZONE: where does your penmanship spend most of its time? High extension/ attention in the UPPER zones (letters like L, T, H, and B) are said to indicate personal expectations, symbolizing optimism, philosophy, ideas, imagination, aspirations, etc. A high stroke can indicate high expectations, goal-setting, ambition etc. A complete lack of activity in the upper zone can indicate that the writer isn’t a free thinker, that they are being led by others who are counseling, advising them. The MIDDLE zone is more difficult for graphologists to interpret. Greater attention to this zone (letters M, E, and R) implies how a person thinks of herself (low self-esteem?) as well as responses to matters in the everyday. More extravagance in this zone can indicate immaturity; childish notions of time, where one is unable to foresee the consequences of their actions, how today impacts tomorrow, etc. Lesser decor, or more compressed writing here shows the range of concern with daily, mundane activities, social life. LOWER zone (lowercase G, Y, J) a person’s reactions to everyday life: writers are inferred by graphologists as private, perhaps insecure and codependent, having low self esteem, distant with strangers. It can indicate desire for material wealth… When a writer replaces a loop in the lower zone with a straight line it can indicate that she is private, reserved, secretive, etc. More grandiose lettering in this zone can indicate that the author wastes time/money while more angular styles can indicate hostility, resentment. Furthermore, graphologists believe that writing slant can imply the writer’s level of openness with themselves, the world. Right slant is usually an indication of being future-oriented. It can also indicate that the writer is an extrovert, a communicator, and is emotionally generous; however, an OVERextended right slant can indicate nosiness, intrusion, over-emotional, manipulative, irresponsibility. Left slant can signal attachment to the past, interest in family history/ancestry, maternal attachment, emotional stinginess, personally reserved, overextending with altruism, etc. Do you stab your pen into your journal pages, or faintly scratch the surface of the paper? Intense pressure of the writing utensil on the page can signal intense, long lasting emotions, stress, taking something too seriously, is uptight. An old journal entry from early 2016. It was one of the loneliest times of my life. See how crowded my words were? Are you the kind to space your words out or to jumble them together? Graphologists have surmised that words crowded together are an indicator that the writer has a desire to be with others. More crowded words with small handwriting can show directness, or thoughts influenced by the past… larger spaces with small letters can show a disorderly inner life. On the contrary, spaced words can be a clue to wanting to be free, desiring wiggle room, room to breathe. large letters with large spacing can indicate clearness of mind while large letters with small spacing can show more hermit-like characteristics, lack of ease with connecting with others. Smaller handwriting can mean the writer is more deliberate, reserved, who ponders, ruminates information she’s received. Again, this is just a sampling of what graphologists pay attention to when analyzing handwriting. They weigh in on so many nuances of one's handwriting and comprise a qualitative idea of who the writer was on the inside. These insights are relative [to timing, personal narrative, life season, etc.] so don’t freak out if you have a left slant and don’t loop your baby j’s! Since we more than likely write differently each time we pick up the writing utensil to scribble a journal entries, we have a spectrum of meaning available to us in our journals.